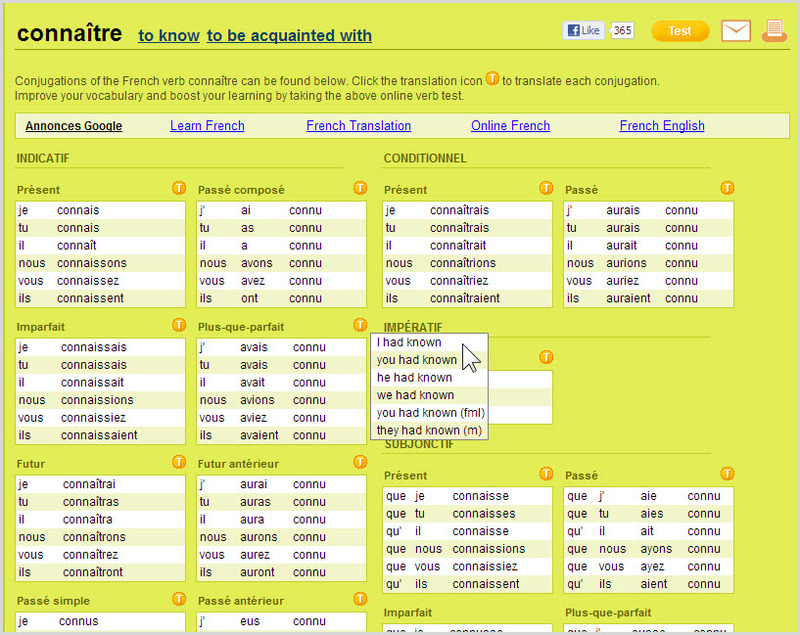 Verb2Verbe is a website for checking the conjugations of verbs in French or in English. When you reach the site, you can enter any conjugation of a verb in French or in English (spokes, she speaks, elles parlaient). The result is a display with a conjugation for each person, tense, and mood of the verb. The title of the results page includes links to conjugations of the verb’s equivalents in the other language. For example, the page for the English verb to know will have links to two French verbs: savoir (which usually means to know things) and connaître (to know or be acquainted with people). You can click the round icon with a T beside each group of conjugations to get an item-by-item translation in the other language. An input form allows you to input a new verb in either language. Reference job aids usually don’t support one specific task. Instead, they tend to organize and present interrelated pieces of information in a way that reduces the time required for someone to remember or research it.